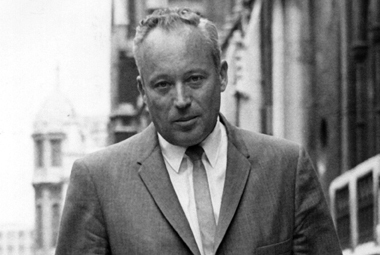 Leon Marcus Uris was born on this day in Baltimore, Maryland in 1924. This is the 88th anniversary of his birth. Son of Polish and Russian Jewish immigrants Leon went to schools in Baltimore, Norfolk and Philadelphia. He failed English three times, but he loved History and Literature. He allegedly wrote an operetta about the death of his dog when he was only six years old. When the Japanese attacked Pearl Harbor on December 7, 1941 Uris dropped out of high school and enlisted in the Marine Corps. He served from 1942 to 1945 in the South Pacific. He was a radio operator and saw combat at Guadalcanal and Tarawa. When he contracted malaria he was sent to San Francisco to recuperate. There he met his first wife Marine sergeant Betty Beck. After his discharge from the service he worked for the San Francisco Call-Bulletin and wrote fiction in his spare time. His first book, Battle Cry, retold his war experiences. Published in 1953 ,and made into a movie by Warner Brothers with Uris as screen writer, the film did well at the box office. His second novel also took place during WWII, but this time in the European Theatre. The Angry Hills is about Greek resistance fighters. It too was made into a movie, this one starring Robert Mitchum. 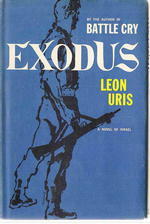 Research Uris did for The Angry Hills and his time as a war correspondent during Arab-Israeli fighting in 1956 lead to most his most successful novel, Exodus. Published in 1958 the book is the result of thousands of interviews. Uris traveled 12,000 miles in Israel and read hundreds of books on Jewish history. Doubleday bought the book which out sold Gone with the Wind, becoming the biggest bestseller in the United States. It was translated into 50 languages. A blockbuster movie starring Paul Newman came out in 1960. Mila 18 is about Jewish resistance fighters during the Warsaw uprising. Armageddon: A Novel of Berlin is about the complications of the Cold War during and after and the Berlin Airlift. Topaz, a spy story, has the Cuban Missile Crisis and the Cold War in its cross hairs. Alfred Hitchcock directed it for the big screen. QBVII is a courtroom drama about a doctor who was pressed into service in a Nazi concentration camp. It was made into a mini series starring Anthony Hopkins in 1974. In Trinity Uris tacked the troubles in Ireland, following the lives of several families from the potato famine to the Easter Uprising. Redemption, written two decades later follows up on the Irish story. The Haj delves again into the troubled Middle East. The Milta Pass is about the Suez Crisis. A God in Runs takes on the American political scene when Quinn Patrick O’Connell runs for president. His last novel, O’Hara’s Choice, was published posthumously, and was not well received. Non fiction works include: Ireland: A terrible Beauty and Jerusalem: Song of Songs both include photographs by his with Jill Uris. This entry was posted on Friday, August 3rd, 2012 at 3:29 pm	and tagged with Leon Uris and posted in Baltimore, Fiction, Film, History, Maryland, Non Fiction, postaday, Thought of the Day, Today's Birthday, World War Two, Writing. You can follow any responses to this entry through the RSS 2.0 feed. Which book is your favorite? I remember my mom reading Trinity (of course).